Behold for the dessert of your dreams: “peanut butter” chocolate mousse. It is chocolaty, creamy and 100 percent amazing! 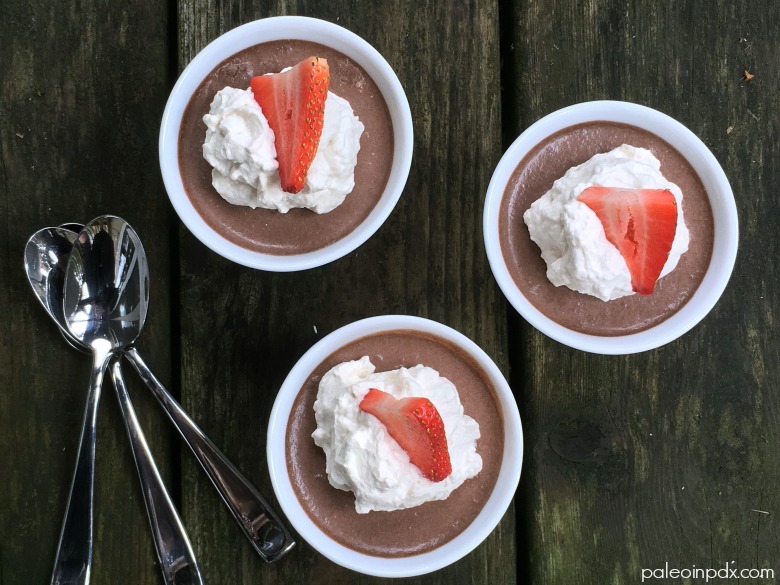 Traditionally, chocolate mousse is made with whipping cream, sugar, some form of chocolate (chocolate chips or cocoa powder), and egg yolks or egg whites — I’ve seen both. Not totally sure which came first. The mixture is also heated on the stove. However, my variation is dairy-free, refined sugar-free, and couldn’t be any easier. No stovetop needed and everything mixes together in the blender. I added sunflower seed butter too, so the final product tastes a bit like a peanut butter cup. It is so decadent and heavenly! Of course, there are no peanuts, but sunflower seed butter mimics a peanutty flavor, in my opinion. If you want a quick, easy and painless Valentine’s Day dessert, make this recipe! Also, if you really want to go all out, make homemade coconut milk whipped cream (or dairy-based whipped cream, if tolerated) and top each serving with a dollop or two. Add fresh berries, fresh grated chocolate or a sprinkling of cacao nibs, if desired. And, one last thing…I will be making this recipe LIVE on KATU Afternoon Live today, so tune in if you like (show is from 3-4 PST). I will share the replay clip afterward though, so you can catch it that way too. UPDATE: watch the replay of my segment HERE! *Note: experiment with a little less gelatin if you want your mousse to be a bit thinner. Also, this recipe sets up fine without “blooming” or dissolving the gelatin first, but I know I am doing it differently than the standard. If you prefer to let it “bloom” in a small amount of chilled coconut milk first and then add it to some warmed coconut milk on the stove, go for it (you’d then of course mix it with the remaining ingredients & pour into dishes). I just know it works for me without doing this step and the directions on my gelatin container even instruct it can be used this way. *To a blender container, add the coconut milk, cocoa powder, sea salt, vanilla, sunflower seed butter and honey. Blend for several seconds or so on low or medium-low. Scrape down the sides with a spatula, if needed and briefly blend again. Then, add the gelatin and blend on low or medium-low to incorporate it into the mixture. Make sure the gelatin is thoroughly mixed in and the mixture is smooth, but don’t over-blend! Immediately pour into small dishes or ramekins and place in the fridge to set. Allow to firm up for at least a few hours or longer, if needed. *Note: this can be whisked in a large bowl by hand, but it’s harder to get a totally smooth texture. You have to whisk somewhat vigorously, but it works pretty well. I have done it this way too and still liked it. The texture was a little thinner too. Blending yields a smoother, thicker texture. Both are good, in my opinion! If you choose to blend the mixture, but want your mousse a littler thinner, see my note above about the gelatin.